In 140 characters, this 72-year-old tweeter who is president of the Pontifical Council for Culture, a Biblical languages expert and archeology scholar showed he is very much a 21st century cleric – one engaged by the literary life of the U.S. and intrigued by the intersection of religion and culture. 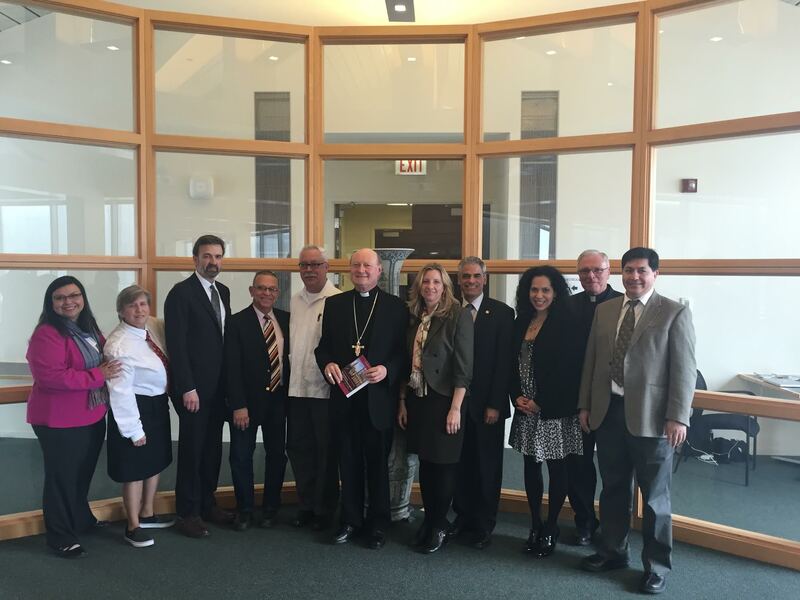 The cardinal came to Loyola University to receive an honorary degree and also participate in a conference titled "The Preferential Option for Culture in Latino/a Theology" organized by former Vatican ambassador Miguel H. Diaz who was also installed as Loyola’s John Courtney Murray chair in public service. The conference was a colloquium that brought together the leading Latino/a theologians in the United States to enagage the history of Latino/a Catholics and to discuss the future of Latino/a theology. The cardinal agreed to a brief interview, conducted largely in Italian, the morning of the conference. He enthusiastically covered a wide range of topics that included interfaith dialogue, the growing number of non-believers or “nones” as they are sometimes called, his childhood in Italy, the first stirrings of his vocation and his love of archeology. Ravasi was born in Merate in the province of Lecco, east of Lake Como in northern Italy. His father was a tax official who opposed Italy’s fascist government and was separated during World War II from his wife and son for more than a year. Ravasi went on to work in archeology*, taking part in digs in Turkey, Iraq, Syria and Jordan. “Archeology is very important in my view because it permits us to understand that man did not start from zero, but is always building upon his patrimony, his heritage.” Archeology drove home for him that religion, or some form of spiritual life, has been a “fundamental tool of existence” through all ages, he says. He began a similar dialogue in Tirana, the capital of Albania, where the conversation included workers and children whose parents are imprisoned. Ravasi says a similar dialogue is planned for Rome – conversations with mothers who are in prison. “We don’t just talk to the intelligentsia,” he says. Judith Valente is America's Chicago correspondent. Giovanna Breu is a former national correspondent for People magazine. * Correction (March 31, 7:38 p.m.): This blog initially stated, incorrectly, that Cardinal Ravasi earned a doctorate in architecture. How sad that you could not bother to find out who the nameless participants are in the picture you chose for the article. They are Latino and Latina theologians. Including them in your article would have helped you engage culture as well. They are from left to right Neomi DeAnda, Carmen Nanko-Fernández, Roberto Goizueta, Orlando Espín, Jean-Pierre Ruiz, to the left of the Cardinal On his right are Marian Díaz, Miguel Díaz, María Teresa Davila, Michael Garanzini, S.J., Nestor Medina. Thank you for providing this information. The caption has been updated. Judith Valente, a regular contributor to NPR and "Religion and Ethics Newsweekly," is a journalist, poet and essayist. She is the author of Atchison Blue: A Search for Silence, a Spiritual Home and a Living Faith, named best spirituality book in paperback for 2014 by the Catholic Press Association and one of the three best spirituality books by Religion Newswriters Association. Her book, The Art of Pausing, was runner up for the Catholic Press Association book award in 2014. Ms. Valente began her work as a staff reporter for The Washington Post. She later joined the staff of The Wall Street Journal, reporting from that paper's Chicago and London bureaus. She was twice a finalist for the Pulitzer Prize, first in the public service category as part of a team of reporters at The Dallas Times Herald in the 1980s. In 1993, she was a finalist for the Pulitzer in the feature writing category for her front page article in The Wall Street Journal chronicling the story of a religiously conservative father caring for his son dying of AIDS.